This week, FedEx sent nine representatives to personally deliver $100,000 worth of scholarships to UND aviation students. The $100,000 is the first installment of the $500,000 that FedEx has agreed to award UND students over the next 5 years. The scholarships were awarded to 29 students who have committed to becoming certified flight instructors. 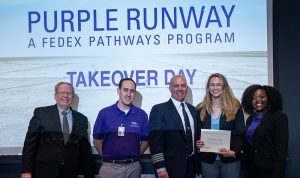 The agreement was announced last fall and is part of FedEx’s Purple Runway Aviation Scholarship Program. Congratulations to all of our very deserving students and thank you to FedEx for making the scholarships possible.